On 19 and 20 July, quiet emissions and occasional denser puffs of white vapor from the summit crater were observed. A zone of fumaroles on the S flank of the volcano, free of snow and ~400 m below the summit, also released a similar amount of vapor as that from the summit crater. Guallatiri, one of N Chile's most active volcanoes, is a symmetrical ice-clad volcano at the S end of the Nevados de Quimsachata volcano group. Information Contacts: J. Sesiano, Département de Minéralogie, Université de Genève, 13 rue des Maraîchers, 1121 Genève 4, Switzerland. Figure 1. Sketch map of the Nevados de Quimsachata area. Volcano names are in large type, town names in smaller type. Roads are indicated by pairs of dashed lines. Contour interval is 500 m. Robert Koeppen's line of sight fro his observation point near Sajama, Bolivia, is shown by a dashed line. The border between Chile and Bolivia is not shown, but follows the crest of the Andes. The quoted material is a report from Robert Koeppen. "On 1 December at 0750, Robert Koeppen (USGS), Walter West (U. S. Embassy, La Paz, Bolivia), and Jaime Jauregui (Geological Survey of Bolivia) observed steam plumes erupting from a source near the crest of Nevados de Quimsachata. The observation was made from a point about 25 km to the NNE, near the W base of Volcán Nevado Sajama, Bolivia. Visibility was initially excellent, but within about 45 minutes cloud cover completely obscured the mountain's summit. 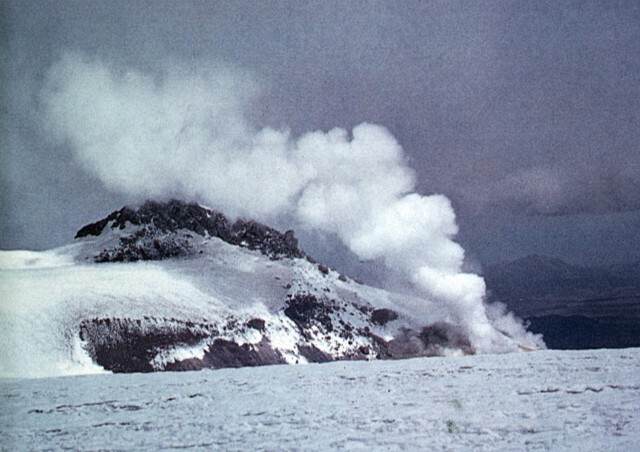 Intervening peaks prevented exact determination of the vent, but the eruption appeared to originate from Cerro Acotango, either from the main summit or possibly immediately to the NW. If the eruption plume came from Volcán Guallatiri, the next possible source area along the line of sight, then it would represent a significantly larger eruption (figure 1). "The eruptions produced white, billowing clouds that rose vertically above the Quimsachata crest, perhaps about 500 m, then drifted W. The eruptions occurred in episodic bursts, and, based on first sightings of the plumes, at intervals ranging from 45-75 seconds. One large plume drifted more NW and appeared to trail a curtain, possibly of ash fallout. Several bursts seemed particularly vigorous and appeared to consist of several plumes coalescing at higher levels." Chilean forest service personnel based near Lago Chungara, roughly 20 km to the NW, reported that they had seen no activity, but visibilities in the area are frequently poor. No eruptions are known in historic time from Cerro Acotango, but Yoshio Katsui and Oscar González-Ferrán (1968) mapped it as Holocene. Four historic eruptions bave been reported from Guallatiri, most recently in December 1960. Chilean geologists note that fumarolic activity from Guallatiri is apparently continuous but less vigorous than the plume emission observed 1 December. Reference. Katsui, Y., and González-Ferrán, O., 1968, Geología del area neovolcánica de los Nevados de Payachata: Publicaciones del Instituto de Geología, Universidad de Chile, no. 29, 161 p.
Information Contacts: R. Koeppen, USGS, Reston, VA; L. López E., Univ. de Chile, Santiago. "During a reconaissance in the Nevados de Pachayata/Nevados de Quimsachata region between 2 and 5 December, vigorous fumarolic activity was observed at Guallatiri. The activity was much more intense than in previous years and the emissions were more frequent, occurring about every 30 minutes. Whitish-yellow columns rose 300-500 m above the volcano's central dacitic dome. Nearby secondary fumaroles extended from the principal vent onto the W part of the volcano (figure 2). Figure 2. Sketch map of Guallatiri by O. González-Ferrán, showing fumaroles active on 3 December 1987. "In December 1985, Robert Koeppen had observed (from the base of Sajama volcano 25 km to the NE) strong fumaroles that appeared to be from Acotango. During the 1987 reconaissance, the volcanoes Capurata, Acotango, and Humarata did not show any signs of activity; their craters were covered with ice and clean snow. Consequently, we believe that the activity observed by Koeppen was not from Acotango, but from Guallatiri [farther along Koeppen's line of sight from Sajama; see map in 10:11], which recently has notably increased its activity." 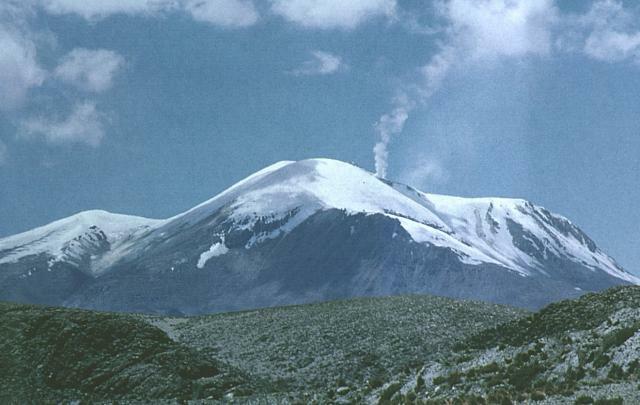 Two strongly active zones of fumaroles were observed during a summit visit on 2 November 1990. The more intense fumaroles, 80 m below the . . . summit, produced a plume 200 m high accompanied by a jet-engine noise. Some boiling mud pools were also seen. The second zone, on the S side of the volcano at ~3,000 m elev, contained about 10 fumaroles. The volcano was otherwise snow-covered. Information Contacts: P. Vetsch and R. Haubrichs, SVG, Switzerland. One of northern Chile's most active volcanoes, Volcán Guallatiri is a symmetrical ice-clad stratovolcano at the SW end of the Nevados de Quimsachata volcano group. It lies just W of the border with Bolivia and is capped by a central dacitic dome or lava complex, with the active vent situated on its S side. Thick lava flows are prominent on the lower N and W flanks of the andesitic-to-rhyolitic volcano. Minor explosive eruptions have been reported since the beginning of the 19th century. Intense fumarolic activity with "jet-like" noises continues, and numerous solfataras extend more than 300 m down the W flank. There is no Deformation History data available for Guallatiri. There is no Emissions History data available for Guallatiri. 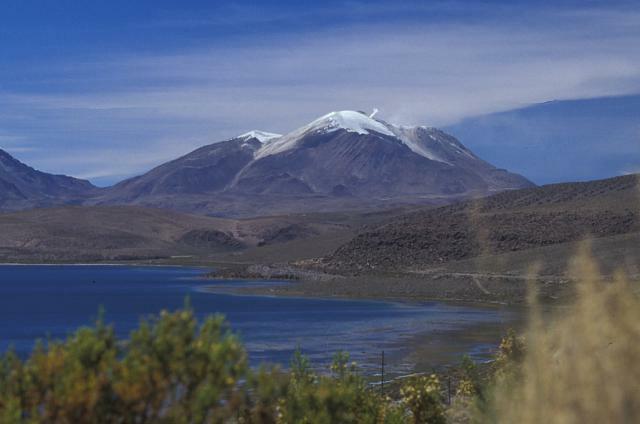 One of northern Chile's most active volcanoes, Volcán Guallatiri (right) is a symmetrical ice-clad stratovolcano at the SW end of the Nevados de Quimsachata volcano group. This view from the west includes three other peaks of the Nevados de Quimsachata group at the extreme left, Pleistocene Volcán Humarata and Pleistocene-to-Holocene Volcán Acotango and Capurata volcano (center). Minor explosive eruptions have occurred since the beginning of the 19th century from 6071-m-high Guallatiri volcano. A vigorous steam plume rises from the summit ridge of Volcán Guallatiri, one of northern Chile's most active volcanoes. 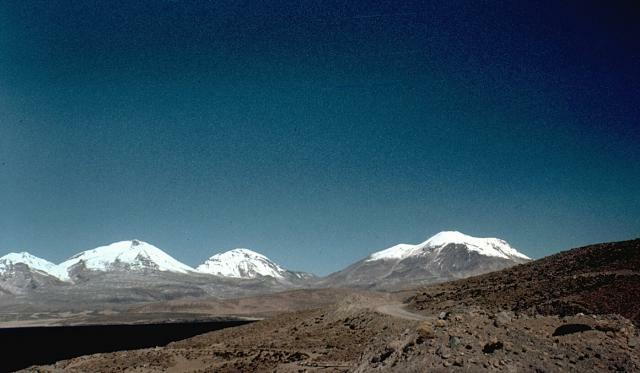 The ice-clad stratovolcano is seen here from the north and lies at the SW end of the Nevados de Quimsachata volcano group. The 6071-m-high Guallatiri is capped by a central dacitic dome or lava complex, with the active vent situated at its southern side. Minor explosive eruptions have been reported from Guallatiri since the beginning of the 19th century, and intense fumarolic activity continues. This prominent fumarole is located in the summit region of Guallatiri volcano. The vigorous fumarole lies 30 m below the summit on the western side and produces a very audible "jet-like" noise. Many solfataras are located along a 300 m section of the upper west flank of the volcano, and another five fumaroles are located on the south side of the central cone. Photo by Sergio Kunstmann-Z (courtesy of Oscar González-Ferrán, University of Chile). Volcán Guallatiri rises to the SSE beyond Laguna Chungará, and steam rises from a prominent fumarole near its summit. 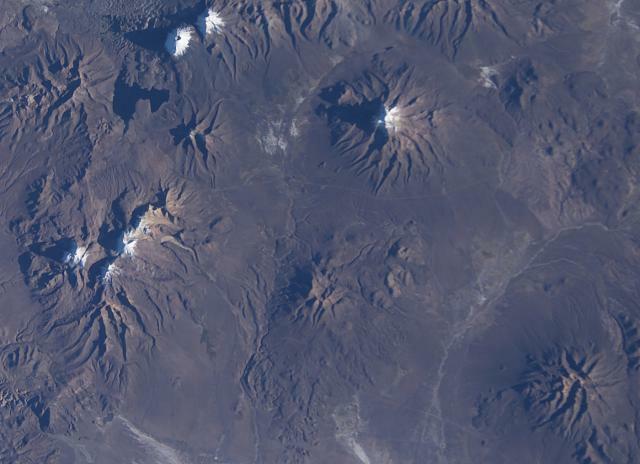 The symmetrical ice-clad stratovolcano lies at the SW end of the Nevados de Quimsachata volcano group just west of the border with Bolivia and is capped by a central dacitic dome or lava complex. Thick lava flows can be seen on its lower northern and western flanks. Minor explosive eruptions have been reported from Guallatiri since the beginning of the 19th century, and intense fumarolic activity continues. There are no samples for Guallatiri in the Smithsonian's NMNH Department of Mineral Sciences Rock and Ore collection. Large Eruptions of Guallatiri Information about large Quaternary eruptions (VEI >= 4) is cataloged in the Large Magnitude Explosive Volcanic Eruptions (LaMEVE) database of the Volcano Global Risk Identification and Analysis Project (VOGRIPA).